Nima and Dawa were separated during surgery in Melbourne. A team of 18 were involved in the operation performed at Melbourne's Royal Children's Hospital. Police Scotland are liaising the Health and Safety Executive after twin brothers drowned when they fell into a fish pond at their family home. Rhys and Shaun Scott, who were two, died after the incident at the rented property in Dalgety Bay, Fife, on Saturday morning. The "long-awaited" boys, whom the parents described as "miracle babies" were reportedly born premature and by IVF. A spokeswoman for the safety watchdog said: "We were contacted by police following the incident and we are liaising with them to try and establish whether there's any call for the HSE to be involved going forward." Two-year-old twin boys who drowned after falling into a garden fish pond in Fife, Scotland have been named locally as Shaun and Rhys Scott. Neighbours are in shock at the drownings of a pair of two-year-old twins, a local councillor has said. Emergency services were called to the scene in Dalgety Bay, Fife, but were unable to save the children. Local MSP Alex Rowley described the incident as "every parent's worst nightmare". Dalgety Bay councillor Dave Dempsey said the whole community is shocked in comments to the Daily Record newspaper. It is enormously sad and my heart goes out to the family. I cannot begin to imagine what the family are going through - it is everyone's worst nightmare. The whole community is shocked. As local councillors, we were all notified that two young children had fallen into a pond and died. To think it is twin boys is heartbreaking. Two-year-old twin boys have drowned after reportedly falling into a fish pond in Fife, Scotland. Emergency services were called to the scene in Dalgety Bay at around 8.20am on Saturday after the boys were found. Officers are supporting the family and working to establish the full circumstances of the incident. A police spokesman said they were called at 8.20am on Saturday and told the boys had fallen in a pond. The children were taken to the Victoria Hospital in Kirkcaldy where they sadly died. Officers are supporting the family at this time. Inquiries to establish the full circumstances are ongoing." 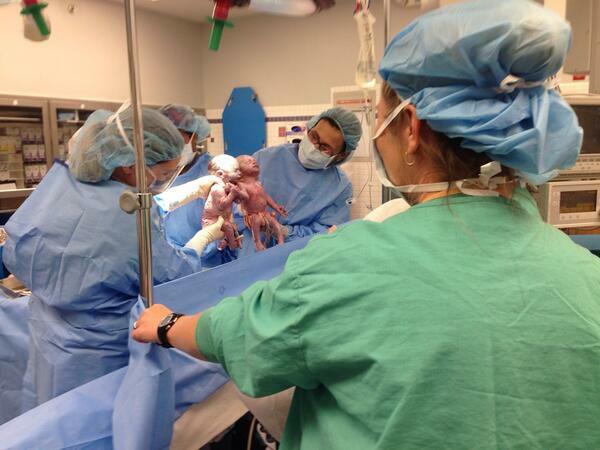 US twins were born holding hands after sharing a rare pregnancy where they grew inside the same amniotic sac and placenta - a one in 10,000 event. The twins Jillian and Jenna were put onto a ventilator after being born but were soon breathing normally. Their mother Sarah Thistlethwaite said: "It's just hard to put into words how amazing it feels to know the girls are OK.
"I can't believe they were holding hands - that's amazing." Miracle twins Alfie and Axel Perkins, from Leicestershire, are wrapped up specially for Christmas — after being born five months early. In their first television interview parents Rosie and Ruby Formosa speak of the "dangerous" way their twins were joined at birth.